Providing you the best range of evaporator with effective & timely delivery. We are specialized in manufacturing a wide range of Evaporators (Combination of Reactor and Heat), which is an industrial device to concentrate solutions, especially with heat sensitive components. 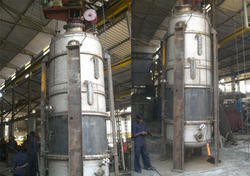 Evaporator is used in Chilling Plant to chill the water using Gas as cooling media. Sometimes it is also used directly to cool the Oil where difference between Oil inlet and outlet temperature is more.